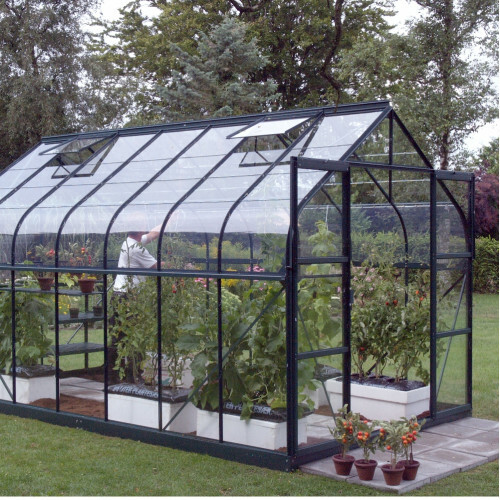 This Vitavia Saturn 9900 greenhouse is relatively simple to construct using the comprehensive instructions which have excellent illustrations. Fast UK customer support is available should you have any problems. This greenhouse is supplied as a self-assembly product. All heights exclude the optional 60mm Galvanised Steel Base. If you choose not to have this base, you will need to supply a raised strip of timber, metal or brick beneath the aluminium framework, to accomodate the lips of the lowest profiles. 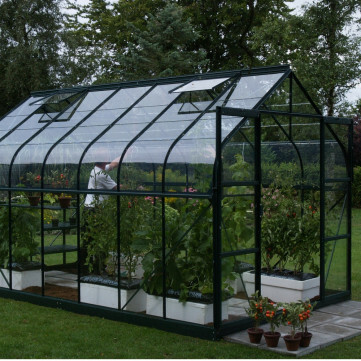 Anodised aluminium surfaces are harder than normal aluminium and have increased resistance to corrosion and wear, which means that your Vitavia Saturn 9900 greenhouse will retain its appearance for many years. Green frames are exactly the same anodised aluminium frame which is then coated with a durable green powdercoat which won't ever flake or chip off.